To improve the acoustics at the performing arts centre, the walls were lined with elements of EGLA-TWIN 4253. This modern ambitious design also enhances the lighting, creating varying effects from different viewing angles. The mesh elements were fixed into place using the Haver & Boecker tension profile and clevis screw method of fixing. The lobby area of Lambton Hall at the University of Guelph, Ontario was fully renovated in 2007. 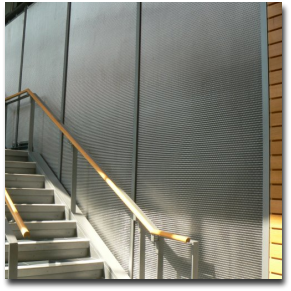 Besides the full restoration of the staircase itself, the walls were clad with architectural mesh type EGLA-TWIN 4223. 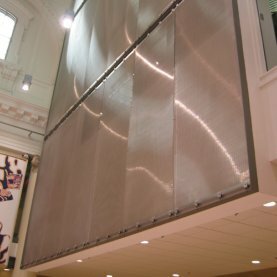 Haver & Boecker supplied ready-to-install panels with the long slots running vertically. Tensioned elements of MULTI-BARRETTE 8106 are installed in the reading room of this Montreal College. The use of stainless steel creates a modern contrast to the tradional ambience of the room. Depending on the viewing angle and the illumination, exciting differening light reflexions are achieved. 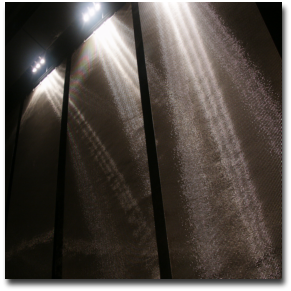 The woven wire mesh elements are tensioned using the Haver & Boecker tension profile and clevis screw system.